BioWare is at it again. 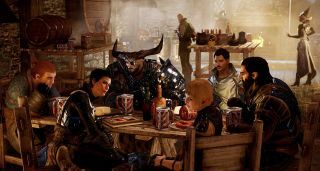 Remember last month, when BioWare's Alistair McNally wandered around GDC wearing a t-shirt emblazoned with the studio's new IP, and nobody noticed? It was the cruelest sort of tease, because it left open the possibility that somebody at GDC—surely somebody!—had caught him on film. Yet that appeared not to be the case, as no photographic evidence, as far as I know, has ever surfaced. And then it closes. What could it be? Based on the color, the font, the stone tower, and the fact that Darrah is the big dog on the Dragon Age franchise, the obvious assumption is that it's something new in that fantasy-RPG series. It might have something to do with the hypothetical Dragon Age Tactics game Darrah asked about in February. Or it might not! That's why they call it a tease, you know.